Maybelline Colour Tattoo in 'Pink Gold' | I have what can only be described as an undying love for the Colour Tattoo in 'on and on bronze' so I've no idea why this one got so neglected. It's an extremely pretty cream shadow in a light rose/berry tone which will truly come into it's own now Autumn has hit. I envisage it layered with MAC cranberry in the crease on Christmas day or blended around the eye for an every day hint of plumy prettiness. 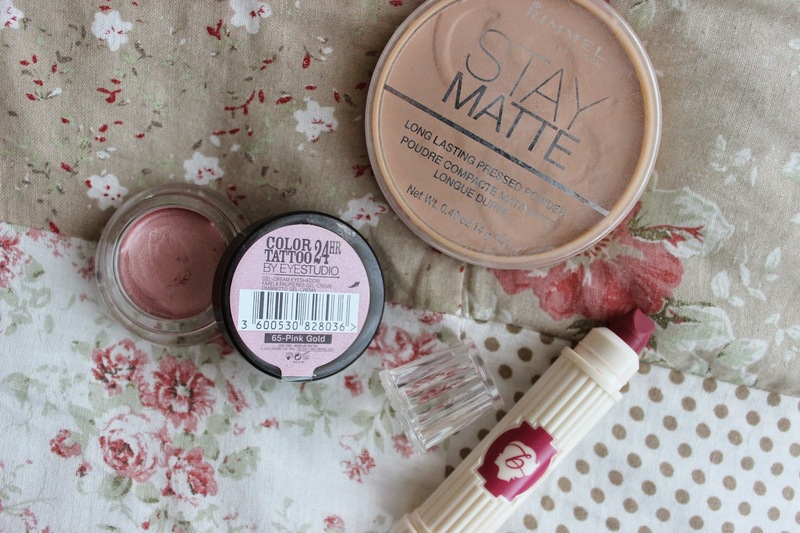 Rimmel Stay Matte Powder | If you've been with the Boutique since the start then you'll know how much I used to adore this, but then the likes of Mille Mac got to me and I fended off anything containing the word 'matte' with a clove of garlic and a stake. However, my new London life involves ALOT of tubes and running around and 12 hour days so I've turned back to this to keep everything on the face in place for a perfect price. Benefit Hydra-smooth Lipstick in 'Fling Thing' | I actually got this back in the Spring (good one meg) so haven't given it much love until now. Purple toned berry shades can be hard to wear in the day but this has a very flattering pink undertone so it's a little less vampire and a lot more wearable. The moistorising, slightly glossy formula also means you can press it on for full effect or pat onto the lips for a quick blackcurrant flush. Have you shopped your stash lately? I never go out of my way to check my existing makeup stash each season but sometimes I'll randomly come across something and thank my lucky stars! I found some (probably too old) lovely bronzer that has a better finish than my current Bourjois one and a few old kohl pencils (just when I was getting into smudgy liner, too). I love the Stay Matte powder but have so many others to get through right now, and I'm so tempted to buy one of the colour tattoos! I have still not invested in the colour tattoos and I really don't know why! For someone a little afraid of eyeshadow they seem like the perfect compromise! I recently found a tiny little solo number 7 eyeshadow hiding in the bottom of my makeup bag and oh my god it is the loveliest champagney colour. So nice for inner corner highlighting! I love the Mayelline Colour Tattoos, my favourite is probably pomegranate!